Benten Island (弁天島) is the island with Onsen located at the mouth of Lake Hamana. It is the one of the tourist spots around Lake Hamana. It has great beach where you can enjoy swimming, fishing and clam capturing. There are many restaurants which serve Unagi, Japanese Eel. There are many Hotels with Onsen. Public parking is available. It became an island around the beginning of 16th century by earthquake. 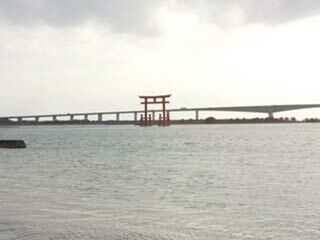 In the 1708, people built Benten Shrine and after that this island was called Benten Island. Because it is on the Tokaido-way, Benten Island used to be hotel towns since Edo Period. Restaurants on the island and round it serves great seafood products from Lake Hamana, especially, Japanese Eel.